We offer a 10 year aerial warranty – on all our full aerial installations. When it comes to getting the best television signal in the area, there are a few things that you can do. 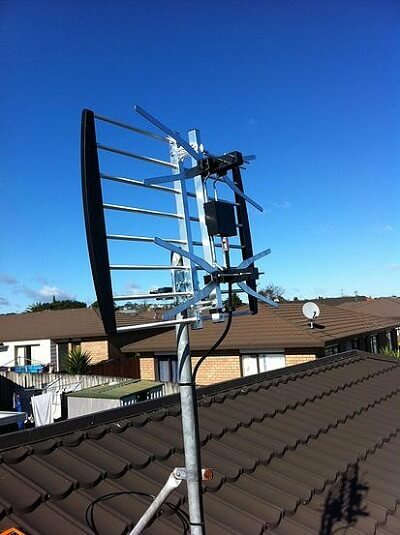 You may want to consider getting a professional TV aerial installation so that you can get digital High Definition freeview TV, which is accessible in almost all of Auckland. One thing is certain, television aerial installs today are definitely not the same as the old days of analogue TV. Today's HD TV installations are far more particular; unlike the ones that were around 10 or 20 years ago. Digital freeview is way more particular than that old analogue aerial. If you had decided to turn your back on these types of Auckland aerial installations several years ago, you may be doing yourself a favour to check them out again and see how much TV picture quality has improved over the years. 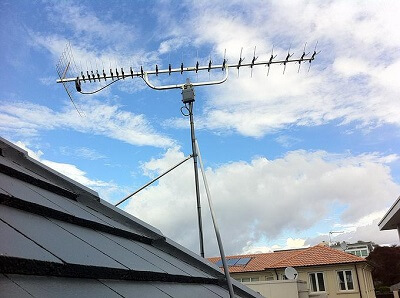 Do not risk your million dollar home to amateurs - when your freeview aerial is installed professionally and done correctly, this eliminates any risk of leaks from occurring. And most of our clients love this type of installation. One word of caution is important, though. You need to have this installation done by a professional company that has plenty of experience. When your UHF aerial installation is done incorrectly, leaks can and do occur. Ask anyone who has had a dodgy aerial install! They will sadly relate their woeful tales of that leaky roof caused by inexperienced television aerial fitters. A simple oversight could end up costing you tens of thousands of dollars in damage repairs. So don't take the risk of hiring the cheapest quote to connect your TV aerial. Deal with trusted experts who know how to install your digital aerial without risking your home's weather tightness. When done correctly, there will not be any heartache with a quality TV aerial fitter. No eyesore when you come home - the experienced staff at Blue Star pride themselves in giving you options (depending on signal strength) to place your new aerial installation directly into the roof cavity if your house does not have a metal roof. A UHF aerial installation using today's technology can be far more pleasing to the eye when it is well hidden away. Even if an aerial in your roof cavity is not an install option our staff work hard to ensure you do not turn your home into an aerial spectacle by your front door! Trust the Aerial Experts - when you call a company like Blue Star, you know that you are contacting a company that has a great deal of experience when it comes to TV signal installations. You also know that you are calling a company that you can depend on. Blue Star staff will get the job done efficiently and correctly. If you want an aerial installation and you are trying to decide how to go about it, contacting Blue Star should be your first priority. Doing so will get you on the road to viewing great TV without having to worry about all of the issues that you might commonly experience with other types of installations. The best part is that the entire operation is worry free. All you have to do is sit back and enjoy it.